What is a running pram? Technically you can run with any pram. I’ve run with my little umbrella stroller when I was rushing to catch a bus – it is possible, but not necessarily ideal over long distances. Excellent Suspension. You’re looking for serious shock absorbers to ensure your precious cargo aren’t being jolted about. Lockable front wheel. 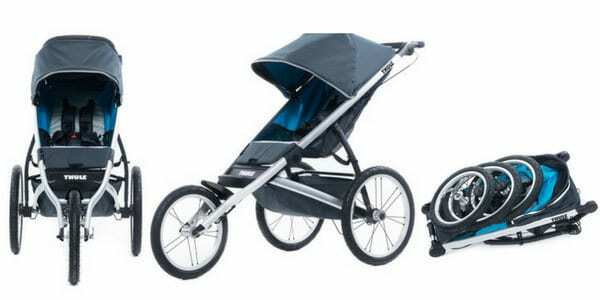 Most prams will have this feature whether or not they’re designed specifically for running. It’s recommended to lock the front wheels on any pram if you are going to run with it or to make navigating over rough terrain a little easier. Handbrakes. Again similar to a bike you want a handbrake so you can ease it on to control your speed, especially downhill. In addition to a squeezable handbrake you’ll want locking brake – which can be on the handlebar or a foot brake. 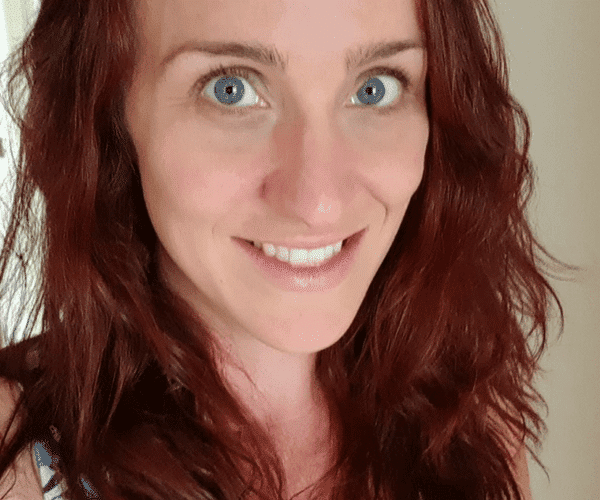 Note: I’m going to include in the reviews whether the prams are suitable from birth – however it’s generally not recommended to run with a baby under 6 or 12 months. So consult your doctor before going for a run with your little one. The best feature on the Thule Glide is it has a whopping weight limit of 34kgs making it the best running pram for bigger children. The fold is a super simple one-handed fold, and it can be wheeled along folded making it really easy to transport. It weighs less than 10kgs so it’s not going to be too difficult to lift in and out of the boot. Storage on this pram is very well thought out – there are two small pockets inside the pram for the child to store drink bottle, snacks, toys etc. A large mesh pocket on the back of the seat. Also the basket under the pram zips closed so you won’t risk losing any items mid-run. The Thule Glide has a fixed front wheel that cannot swivel, so is not suitable for strolling where you need to turn sharply. So keep in mind this is a dedicated running pram. The double version of the Thule Glide (Thule Glide 2) has all the same great features, with a total weight capacity of 45kgs (so still a very generous 22.5kgs per seat) and total pram weight is a 14.5kgs. Suitable from birth – Yes, with bassinet sold separately. Bob Ironman is a little bit more of a budget-friendly running pram, but it still ticks all the important boxes to be a highly effective running pram. Similar to the Thule, it has pockets inside the seat for snacks and drinks for the child. It also has a very neat snack tray that can be purchased separately. It has a half recline – far enough back for a toddler to have a nap, but the seat is not suitable for newborns. The shock absorbers are adjustable depending on the weight of your child for optimal support. It has a large and very accessible basket underneath and a pocket on the seat back. The hood is huge and has a big peekaboo window. It’s also quite light weight and easy to fold. Just keep in mind the BOB Ironman has a fixed front wheel that cannot swivel for turning sharply on tight corners. Reversible seat – Yes, but only with the bassinet or car seat sold separately. Mountain Buggy is known for it’s rugged, tough, all-terrain, highly durable prams and the Mountain Buggy Terrain is no exception. Although the seat does lie back completely flat for newborns if you do choose to purchase the “Carrycot Plus” sold separately when your baby is older they can actually be in a semi-upright position while parent facing! Making it one of the very few running prams that offer the option of a parent-facing toddler seat. It also comes with two sets of wheels; 16 inch wheels for running or hard terrain, and 12inch wheels for when you’re just cruising around town. The front wheel be locked or swivel for easy maneuverability in tight spaces. Also I love that the Mountain Buggy Terrain has a zippable storage basket to stop items bouncing out when you’re running. Suitable from birth – Yes. I love Baby Jogger prams. In fact a pram list would not be complete for me without featuring at least one of their prams. 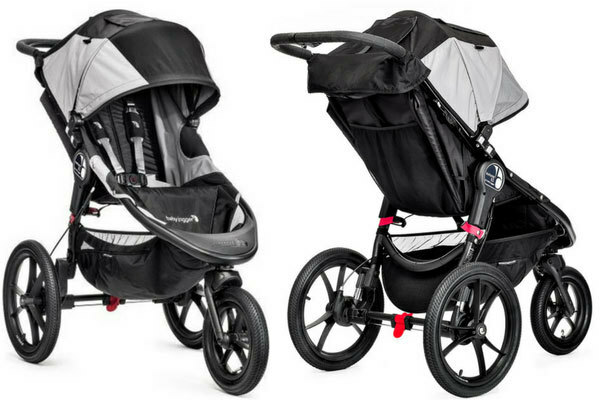 However despite the name not all Baby Jogger prams are actually suitable for jogging – except for the Baby Jogger Summit X3! The Summit includes all the features I love about Baby Jogger prams – roomy seat, big hood, large basket, huge weight capacity (34kgs like the Thule Glide!) and of course it has super easy fold. The Summit also has all necessarily features for running. Though there’s no cover to secure items inside the basket it does have a huge mesh pocket on the back of the seat for safely storing important items. 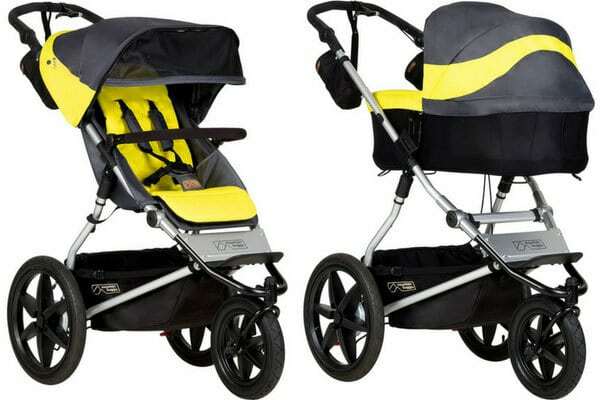 I also think the Summit would be a great everyday pram, on or off the running track, because it’s suitable for newborns and has a lockable swivel wheel so you can still use it for urban cruising. I have to admit choosing the last pram for this list was really hard. 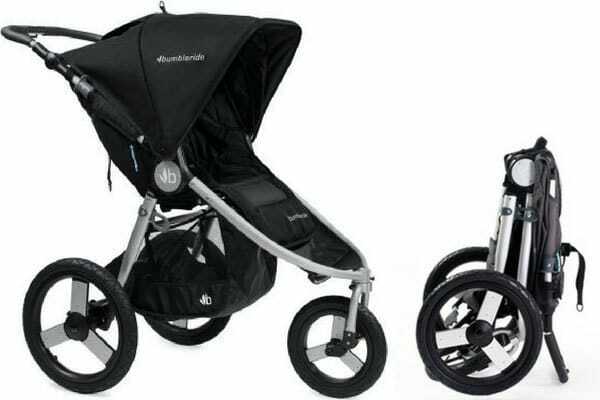 Just so you know the runner up prams (see what I did there) were the Phil and Ted Sub 4 and the Bugaboo Runner, but I’ve gone with the bumbleride Speed because it has a lot of aweome features. However I’ll let you know there is one pretty big drawback as a running pram – it doesn’t have a handbrake. 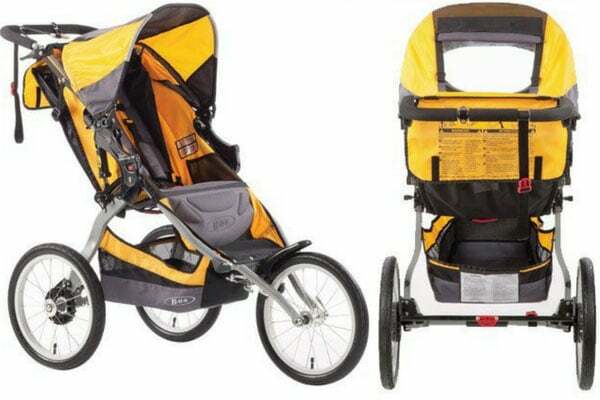 So I’m going to say this is a great pram for running on flat surfaces; running tracks, foot paths, even a bit of rough terrain, but I wouldn’t recommend it for running on hills. That said the bumbleride Speed is a great pram. Firstly bumbleride pride themselves as an Eco friendly brand. You can read up on all their fabrics on their website, but basically there are 28 recycled plastic bottles in the bumbleride Speed. Which I think is pretty awesome. One of the best features on the pram is the three speed adjustable front wheel. It has a complete swivel setting for city strolling, a 30% swivel position for jogging when you still need a little maneuverability, and then completely locked into position for fast running. The fold is also super simple, with a carry strap and automatic lock. The bubleride Speed would be a great everyday pram as well as a running pram, but again as long as you don’t want to run downhill. Suitable from birth – Yes, with car seat and adapters sold separately. 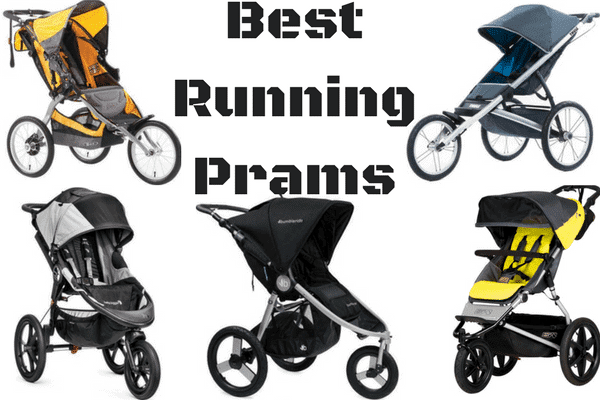 I hope that helps you find the best running pram for your family! 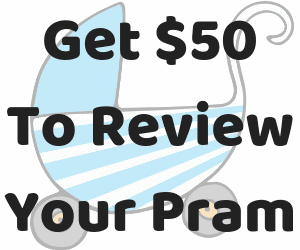 If you still haven’t found what you’re looking for, or you need something other than a running pram check out our pram reviews section for tonnes more reviews and recommendations! Also keep an eye out for my Best Double Prams of 2017 coming soon! Or if you have any questions about prams please feel free to comment below and I’ll do my best to help you out. Great research. We have noted your comment about the hand brake and have passed it on to HQ. As with all the prams, there is room for improvement and we are certainly open to suggestions. At the same time we are really pleased that you like the 3SpeedSteering system with the different settings on the front wheel for different speeds as well as our efforts to be eco-friendly. Please get in touch if you would like to test one of our other models. I love all of the options…but will never be game enough to run with a pram! ?? Not sure if it classifies as a running pram but I used to run with both boys in the Phil and Ted Sport. Loved it. Otherwise it was definitely on my radar. Oh that’s interesting… Maybe it’s a liability thing? I did some pretty serious running up very steep hills with two children in there – was really happy with it. God I hated the brake on that thing though. Bloody hard to put on and off. Like – have to get down on hands and knees and wrestle with both hands kind of tough. I was looking at that brake unsure if I thought it was genius or not! It looks like the kind of thing that’s fantastic in theory, but a pain in practice. The hand brake thing though, not the foot brake. No I’m talking about the foot brake. It deadset needed a set of hands and feet to operate. Dreadful. So handy for running mums- you should see if they’ll share it in the Running Mums Australia group! That would be amazing! Thank you. If only I was a runner! I’m all on trying to figure out how to coordinate dogs and prams, I think running is out of my league! What about off road prams? I have so many forests around with dirt tracks. My pram doesn’t cut it. I need s pram with shock absorbers and 4WD wheels! I’ve been thinking about writing a list for those as well! Because there’s a bit of confusion between running prams and all-terrain prams. I’ll see what I can whip up! My 8 year old is under the max weight for the Thule…. I think it would look a little weird though! You are the queen of pram reviews Rachel. Another fantastic round up ?? Excellent round-up! I definitely could have done with this when my youngest was a baby and I started running.